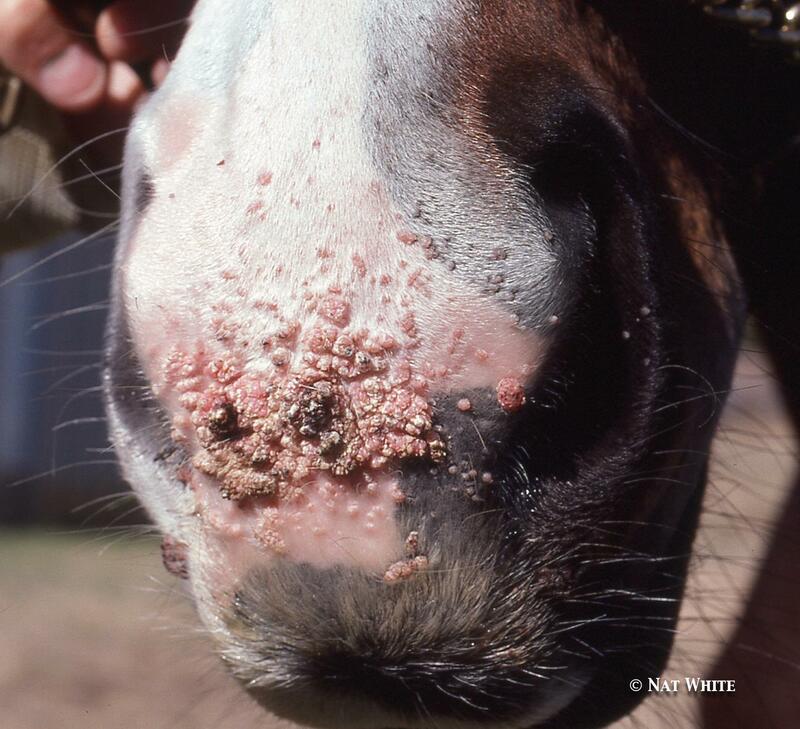 Hagyard Equine Medical Institute’s Dr. Luke Fallon tells you everything you need to know about several common skin issues—rain rot, ringworm, warts, and hives—including tips on prevention and treatments. Skin problems can affect almost any horse anywhere, whether you live in a tropical climate with year-round heat and humidity or are preparing to start blanketing your pony against autumn rains and winter snow. Luckily, most are straightforward to treat—but it’s helpful to know whether your horse’s particular issue is caused by bacteria, fungus, virus, or an allergic reaction. We got the skinny—plus some treatment and management tips—from Dr. Luke Fallon at Hagyard Equine Medical Institute. Bacteria causes rain rot, but that doesn’t mean you need to reach for antibiotics immediately. 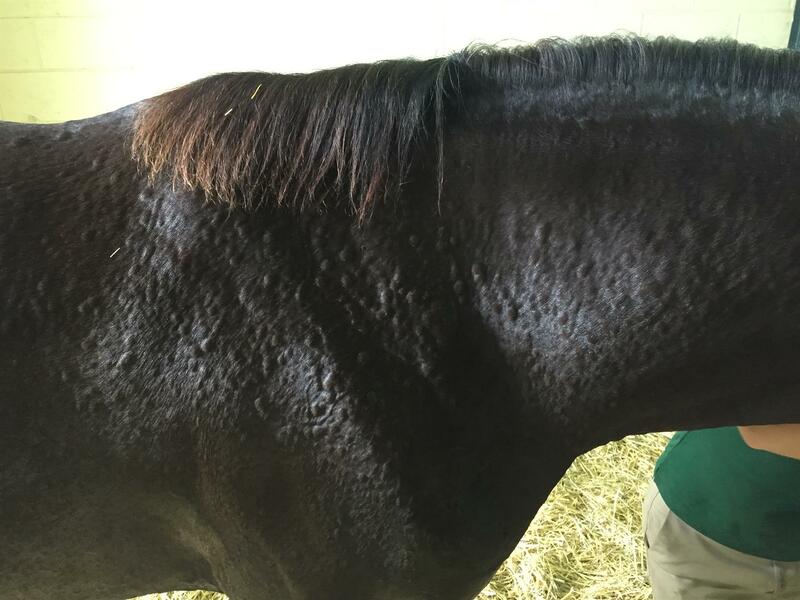 “Typically, you can pick off or debride those scab-like lesions, and I find that it’s better to do that, followed by treating the horse’s skin topically with a medicated shampoo, which can then get directly to the area that needs to be treated,” Fallon said. Medicated shampoo isn’t the only weapon in the arsenal against rain rot. “I’ll often treat those horses not only with medicated shampoo, but we also use lime sulfur or a shampoo with lime sulfur and captan that also has soothing aloes in it,” Fallon said. Also good: shampoos that contain iodine, betadine, or chlorhexidine. If the horse is sensitive and objects to having the scabs peeled, scraped, or scratched off before shampooing or another topical treatment, Fallon has some suggestions for softening the scabs to make them easier to remove. Rain rot can occur at any time of year, and, despite its name, its appearance doesn’t necessarily have to do with a prolonged period of wet weather. That’s one reason it’s so important to make sure your horse is completely dry before tossing on a blanket. Never share brushes or blankets between horses. Disinfect brushes regularly (for tips of the best way to disinfect brushes, buckets, and stalls, see this Equestrian Weekly article). If your horse has sweated excessively, even if he’s only been standing in his paddock, bring him in, let him dry off, and bathe him to get rid of the irritating salty residue. Keep your horse’s blanket cleaner than you keep your own barn coat! 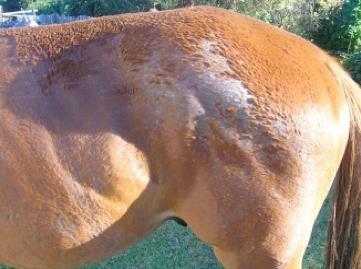 Give a preemptive antimicrobial bath if horses around yours are coming down with rain rot. In more severe cases, your veterinarian might need to prescribe systemic antibiotics. “Typically, if they’re very irritated or if there’s a lot of pus underneath when you pick off those scabs or crusts, I’ll quite often put them on something, such as sulfa drugs,” Fallon said. “Used with the shampoo, that will typically kill the bacteria. Less serious cases with smaller, more dispersed scabs typically resolve with topical treatments alone in a week or 10 days, said Fallon. Ringworm’s name is misleading: it’s caused by a fungus, not a worm. Like other skin diseases, it can spread easily from horse to horse, but ringworm also can pass from horse to human—so good hygiene when handling an affected horse is a must. 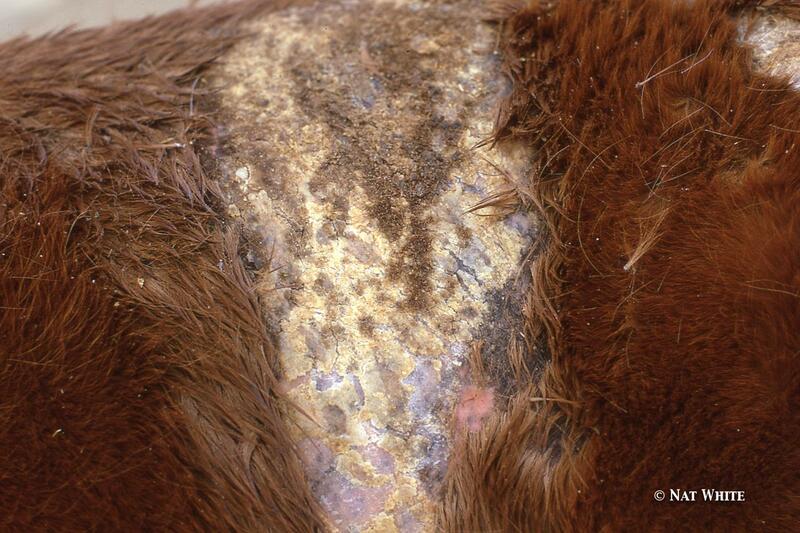 “Equine ringworm doesn’t typically affect humans, but there have been cases,” Fallon said. Where rain rot typically has a scattered appearance, ringworm lesions are usually more distinct patches of raised skin, often round, which have lost hair and can become scaly or crusty. 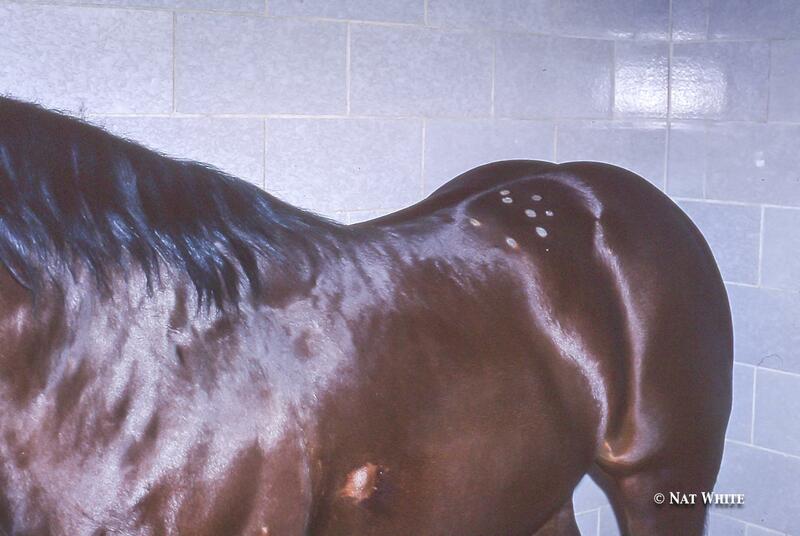 Ringworm isn’t uncommon in populations of younger horses, like weanlings and yearlings, but it can also affect horses in training, where it sometimes begins at the site of a girth rub or other places where tack has chafed the skin. The treatment for ringworm is much the same as for rain rot, and, in fact, many of the antimicrobial shampoos—including those that combine lime sulfur and captan (captan is a fungicide)—on the market today will work for both. But you do want an antifungal component to your treatment if the diagnosis in ringworm, Fallon said. Systemic antifungals, which can be administered orally or intravenously, also can have some side-effects. They can affect liver and kidney function and can cause changes in behavior and appetite. “These are things to consider when using systemic antifungals, so please consult your vet,” Fallon said. Keeping tack clean and disinfected—and not sharing these items between horses—can help prevent the fungus from spreading. “If your horses are sharing brushes, you’ll see that ringworm run right through the barn, if you’re not careful,” Fallon cautioned. A horse can get hives for a variety of reasons, from an insect bite to a contact or food allergy. And while hives aren’t a true skin disease, they’re worth mentioning here partly because they can be hard to distinguish from rain rot or other skin problems. Banamine and oral antihistamines can be the horse owner’s first line of defense, but, as always, be sure to call your veterinarian before medicating—and certainly get veterinary advice before administering steroids. Warts can sometimes appear around the muzzle or eyes, as well as in the ears, and while they aren’t necessarily a serious problem—unless they are located where the bit rests—they can be unsightly. Treatment generally involves getting your veterinarian to scrape the warts away, which causes them to bleed—and causes the horse’s own immune system to step up its response to the virus. “Within about three weeks, they usually will shed the warts on their own,” Fallon explained. Other topical treatments include glycerin or specialized anti-wart formulations. This entry was posted in Education, Horse Health, News and Announcements on October 11, 2017 by ludlumfarms.